They come bearing satellite TV. Brazil’s Batalhão de Operações Policiais Especiais, or BOPE, is an elite force of military police who often specialize in urban operations in Rio's slums—or favelas. As the World Cup and the Olympics approach, BOPE forces are appearing more and more often. And their techniques are evolving. BOPE has cleared dozens of neighborhoods over the past few months, and even more over the past few years. 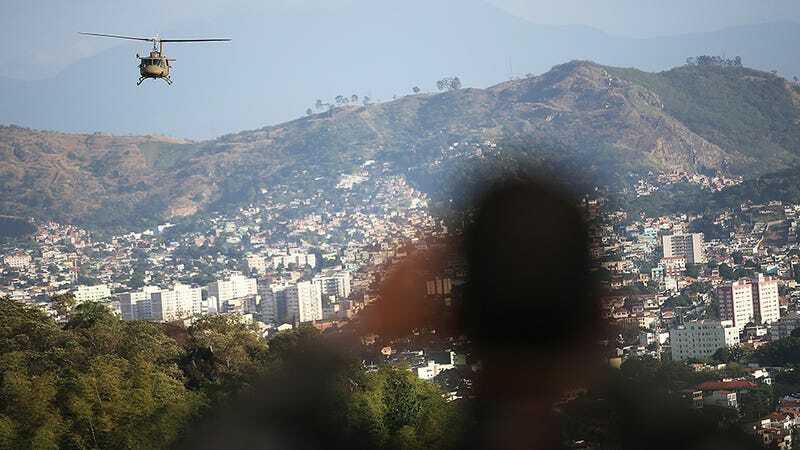 The Guardian reports on the group’s 35th favela-clearing operation this week, describing the multi-step process of extraditing criminals without harming innocent bystanders. First comes the paramilitary operation BOPE is best known for: Sweeping the perimeter and “engaging” targets known for crime or drug trafficking. A team of street cleaners swept the roadsides and picked some of the rubbish from the filthy stream below.…Next followed a switch of symbols. Red Command graffiti was whitewashed over and the Policia Militar insignia–a dagger through a skull–was draped over the walls. A brief propaganda display followed: local children were invited to ride on police horses, a PR team displayed the bags of cocaine, cellophane-wrapped blocks of hash and the gun clips they said had been found in the search operations, and a mobile sound van repeatedly broadcast an appeal for support... Another eye-popping change was the arrival of two Sky [TV] salesmen. Despite this "hearts and minds" approach, there have been many protests over the clearances. Upwards of a dozens people have been killed during clearance operations in the last few weeks, and some residents wonder if BOPE is using excessive force in its operations. The controversy sits at the heart of a debate that’s been going on for years, both in Brazil and elsewhere. In some cities, a huge portion of inhabitants live in so-called slums—1.5 million in Rio alone—and many of these are quiet, residential neighborhoods that have been around for decades. For some residents, the idea that their comparatively well-established neighborhoods need to be “cleansed” is both offensive and simply incorrect. Meanwhile, supporters of the program point to situations where gangs and drug-related crimes have percolated for years; one recent NPR story, for examplem reported that raids are improving in both their accuracy and their effectiveness. To make matters worse, most favelas are tightly-knit communities, both culturally and geographically, which makes it difficult to differentiate between neutral and dangerous zones. But ultimately, whether in support of the raids or against them, one thing seems clear: They wouldn’t be happening if the World Cup and Olympics weren’t approaching. The same kind of urban whitewashing has riled up residents (and preservationists) in host cities for decades now—from the destruction of traditional Hutong communities in Beijing, to the razing of whole neighborhoods in Cape Town to make way for the 2010 World Cup.